The photo was taken at the historic Yukon river on the north side of the bridge and pipeline crossing. 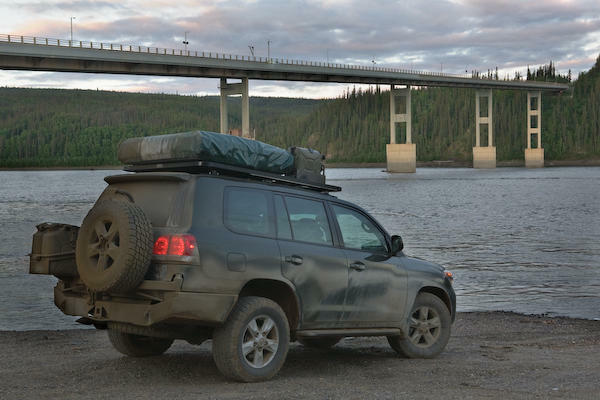 Arriving in Fairbanks about 6.30AM the Land Cruiser was just in time for it’s second service that had become due along the Dalton. I followed Jay to a car wash and we hosed down our vehicles a few times to get as much of the calcium chloride off as possible. Originally I thought they only use this stuff during the winter but have since learned it is also used to keep the road bound together in dusty or gravel conditions. After the wash I wished Jay well on his way as he headed off to a Susuki garage before traveling south to Denali and I made my way to the Toyota garage. After the service I made a stop at Radio Shack to get a replacement CB antenna and fixture and called Toyota in Anchorage to order a replacement windshield. Then I made my way to a motel to get some sleep! Later that afternoon I learned that the security system in my vehicle disables everything if one of the doors is not closed properly. After spending a couple of hours on the problem including calls to Toyota to discuss various options including resetting the system by disconnecting the batteries I noticed that a rear door was not shut properly. After opening and closing it, something they hadn’t suggested, everything worked again! It makes me wonder what you do if one of the door sensors breaks and you are in a remote location.